(L,Tall) Mens Vintage 70s Short Sleeved Disco Shirt! Gray Flowers on Soft Tan Circles! 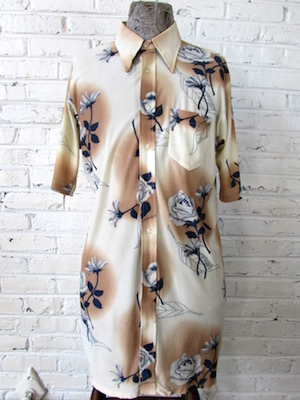 Home > Men's Vintage Shirts > All Men's Vintage Shirts > (L,Tall) Mens Vintage 70s Short Sleeved Disco Shirt! Gray Flowers on Soft Tan Circles! 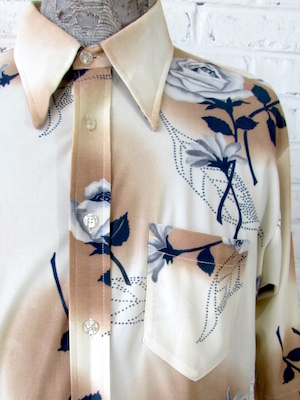 Mens vintage 1970s short sleeved disco shirt. Cream colored base with soft, tan circles with gray, white and navy flowers in their center. Shirt is very long so it is perfect for a very tall man. Has a super wide & pointy disco era collar. Closes in the front with pearly brown buttons. Shirt has one patch pocket on the chest. Tagged by The King Size Co. Acetate/Nylon blend.